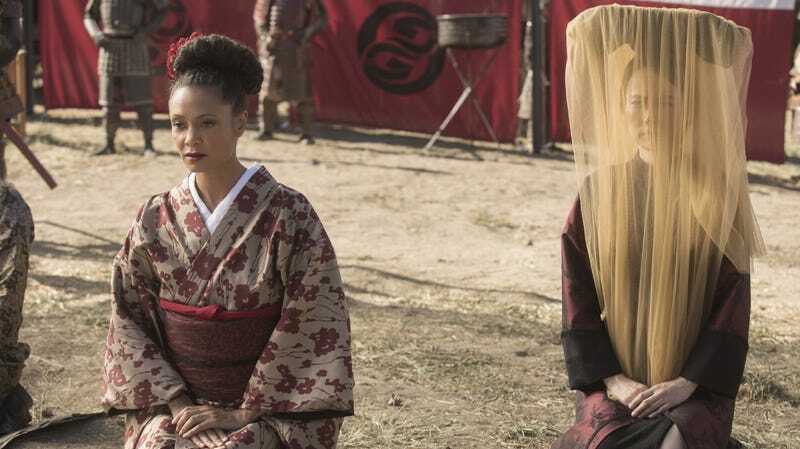 Maeve (Thandie Newton) meets with the Shōgun. The latest episode of Westworld was more about the action than the theories, taking us deep into Shōgun World for some nighttime ninja battles and doppelgänger chit-chats. But it wouldn’t be Westworld without having at least one shocking surprise—this time involving our favorite host, Maeve. Plus, there’s that whole “The Cradle” thing. Join the debate! Discussion points below. io9's Beth Elderkin and Gizmodo social editor Joe Tonelli roll up their shirtsleeves to figure out how the hell Maeve got her hands on some robot telepathy. Tonelli also introduces us to a bunch of theories about “The Cradle,” a location that’s going to play a major role in the weeks to come. 1. What is Maeve’s new “telepathic control” ability and where does it come from? Is this part of the Mesh Network, or is she tapping into the remains of Arnold’s Bicameral Mind? 2. Who would you side with: Dolores or Maeve? 3. Why do one-third of the hosts have “virgin brains,” and do you think Dolores is responsible for that? If so, what is her motivation? 4. What is “The Cradle,” and who destroyed it and why?